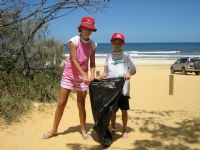 Katherine Easey and brother Thomas were joined by 933 other volunteers at the 2007 Toyota Fraser Island Clean Up Day. 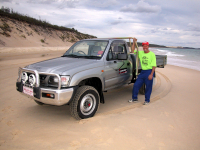 Queensland plumber Peter Davies won the 2006 Fraser Island Fishing Expo’s major prize, a V6 petrol Toyota HiLux with Toyota Genuine Heavy-duty Steel tray and Forge Alloy Bull Bar. Leigh Hannant from Hervey Bay claimed the lucky draw prize on the final night of the 2005 Toyota Fraser Island Fishing Expo – the Toyota HiLux 4.0-litre V6 packed with Toyota Genuine accessories. In a lucky draw on the final night of the 2005 Toyota Fraser Island Fishing Expo, Leigh Hannant from Hervey Bay claimed the prize – the recently released Toyota HiLux 4.0-litre V6 packed with Toyota Genuine accessories. Miner Kevin Cracknell from Blackwater, west of Rockhampton, won a Toyota Echo 3-door manual hatch worth $14,740 in the prize draw during this year's Toyota Fraser Island Fishing Expo. Brisbane fisherman Peter Archer, left, receives the keys to the new Toyota HiLux turbo-diesel four-wheel drive worth over $35,000 he won in the major prize draw during this year's Toyota Fraser Island Fishing Expo. Toyota senior manager, northern region, David Stone, made the presentation. Toyota's Northern Region senior manager David Stone (left) congratulates Les Apps and wife Lyn after they won the major prize at the 20th anniversary Toyota Fraser Island Fishing Expo, a Toyota HiLux V6 SR5 Dual Cab 4WD. The Queensland Parks and Wildlife Service has been helping Toyota Australia and fishing competitors carry out environmental initiatives at this year’s Fraser Island Fishing Expo. Ian Hall, the 2002 Toyota Fraser Island Fishing Expo major draw winner with his prize on Orchid Beach - a brand new Toyota HiLux Turbo Diesel 4X4 trayback. The 2003 Toyota Fraser Island Fishing Expo will offer competitors a chance to win three vehicles as part of the 20th anniversary celebrations. Ian Hall, the 2002 Toyota Fraser Island Fishing Expo major draw winner with his prize on Orchid Beach - a brand new Toyota HiLux Turbo Diesel 4X4 trayback valued at over $39,000.